This is a propaganda film, made for the Polish ministry of Information and Documentation in 1943. It is also one of the few experimental films made during the war. The dialogue is a frank entreaty to 'Mr. Smith' (Mr. Everyman), to open his eyes to the programmed destruction of Polish culture and the tragic devastation brought about by the Nazis. The Themersons realised this through a collage of newsreel footage and still photographs. Some stills were cut into silhouette, some were slides, and all animated and dissolved in light and shadow, and tinted in Dufay colour. The mode shifts between the documentary and the allusive. All of the visual materials are ready-made images, apart from Franciszka's drawing of 'Mr. Jones' (who 'still believes the Germans are cultured'). 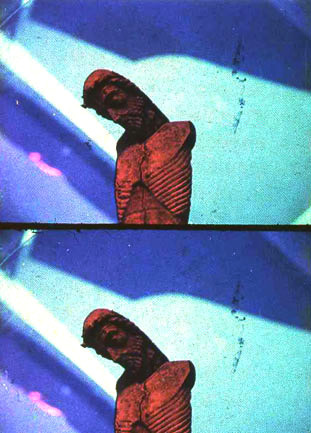 The Themersons declined to cut an image of a hanged figure objected to by the censor, and the film was only shown privately, in October 1943 at the Polish Film Unit, and two months later at the Edinburgh Film Guild. The form and spirit of the film are very close to those of a 'Manifesto to the people of the world' distributed by the Polish resistance in February 1941, and published as a pamphlet 'Underground Poland Speaks', in many editions 1941-42, by Liberty Publications, London.